Image courtesy of Ethos Books. Singapore is a country that is grounded in migration. How have we as individuals—or the generations before us—made it home? Join historian Mandakini Arora as she talks about home, identity and gender, based on her oral history interviews with British women who arrived in Singapore in the two decades before its independence. Her interviewees include Jean Marshall, the widow of David Marshall, Singapore’s first elected chief minister. 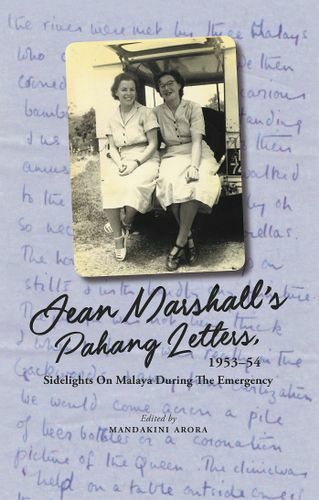 Jean’s letters “home” to England were written in 1953–54, when she was posted in Malaya with the British Red Cross, and have recently been published. Today, 65 years later, Jean calls Singapore her home. She is not unique in her shifting notion of home in today’s globalized world. Through the collective stories of these British women, Mandakini explores the dynamic processes whereby we make a place home. Mandakini Arora is a historian of gender and colonialism with a penchant for oral history. She started life in tea country in the northeast of India and went to boarding school in Darjeeling followed by college in Delhi. She has a master’s degree in Indian history from Jawaharlal Nehru University and a PhD in Russian history from Duke University. Mandakini moved in 1999, with her husband and daughter, to Singapore where she has lived since. HistoriaSG is a lecture series at National Museum of Singapore that focusses on important but lesser-known aspects of Singapore’s history. With in-depth presentations by local and international academics on a range of topics viewed through a variety of lens from business to science and technology, the environment and specific communities, the series sheds new light on Singapore’s culture, history and heritage.